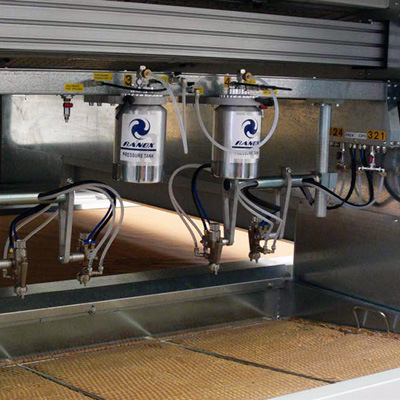 Neospray Paper is an automatic spraying machine with conveyor equipped with disposable paper, with two oscillating arms, for applying paints, glues, hues and liquid products in general on full panels or without windows, rectangular or shaped, flat or profiled, by means of automatic spray guns. The main characteristic of the disposable paper conveyance is its functional capacity in connection with the maximum cleanliness of the part conveyance member. Neospray Paper was conceived to be used on small and average productions, where a frequent colour change and an extremely functional capacity is required. It is applied when painting wooden, glass and plastic gifts and fancy goods, panels and doors, etc.